I'm sure there are many of you out there who have a World's Greatest Dog, right? Well if there were an award, our rescued three-legged pit bull Bella would definitely receive a nomination - if not take home the gold. 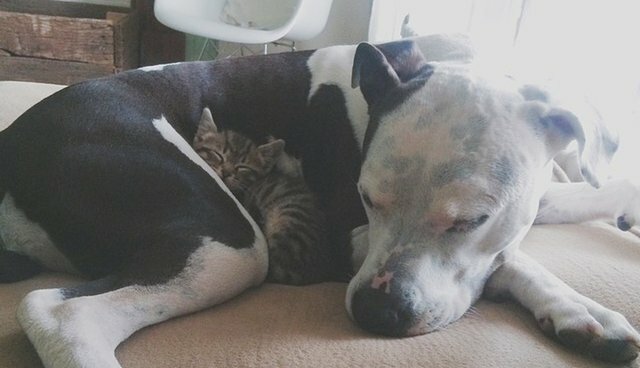 When we started fostering with our local shelter we already had a fairly good idea of how Bella would react to the new house guests. She had already befriended a rescued cow, watched over piglets saved from slaughter, and looked after battery-caged chickens from the largest farmed animal rescue in California's history. But we never anticipated just how stellar her mothering skills would be. Pit bulls are often victims of prejudice and discrimination, but contrary to popular conceptions this breed has some of the most gentle and stable temperaments. In 2011, the American Temperament Test Society showed the American pit bull terrier scored an overall temperament rating of 83.9 percent compared to the 77 percent score of the general dog population. I know this, and a quick Google search will easily tell you the same. But I want you to see and experience this. So far, Bella has helped me care for three litters of kittens, and she has always been gentle and kind. She gladly shares her water bowl, her dog bed, and her human attention. She takes turns grooming them, and they greet her every morning by curling around her legs, and cry when she comes in from her walks. 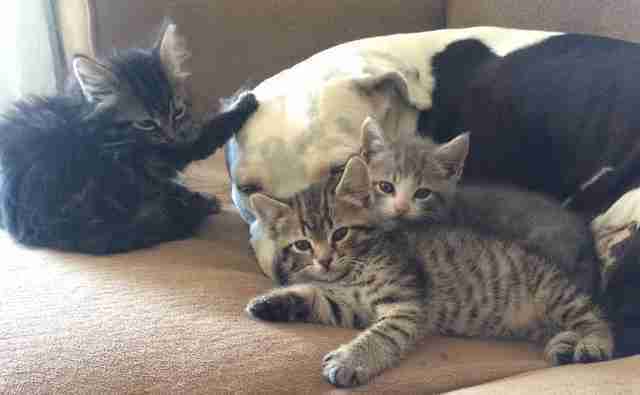 Bella is doing her part to make sure these kittens are well adjusted and adopted into their forever homes. When they head back to the adoption floor in a few weeks, their enclosures will proudly read, "dog-friendly". Watch the video below to see what I mean!